Yes Virginia, Christmas has come early! My camera has closed it's shutter for the last time. CAUSE I'M JUMPIN' FOR JOY! "Get your boots on Virginia, were goin' camera shopin'." Although my camera isn't as old as the one pictured here...it certainly felt like it at times, especially without a macro option (that word has become music to my ears). It's quite possible I've paid the equivalent of two new cameras with all the batteries purchased over the course of time. For any of you that have stock in Duracell batteries..."you're welcome." If I were to leave the selection of my new camera up to my family... I've no doubt this is what they'd pick out. Wow, that would be one hard flash dot to shake from your retinas. I'd be the envy of every paparazzi in Hollywood. Due to the demise of my camera... I wasn't able to bring you all my personal favorite Thanksgiving confections. So, I'm bringing you a few samplings with a little help from my friends. Here's a simple, but elegant gift for your host or hostess. Preserves or compote jars adorned with a few autumnal embellishments. Here's a vintage tag for your favors. Shhh, I use Trader Joes pumpkin bread mix and a 6-mini's fluted bundt pan. 1 whole Trader Joes jar of Pumpkin Butter. 1. Bring first 3 ingredients to a boil in a 2-qt. saucepan over medium heat, whisking constantly; boil, 1 minute. Remove from heat; gradually whisk in powdered sugar and rum until smooth. Whisk gently (or mix on low) 3 to 5 minutes or until mixture begins to cool and thickens slightly. Pour immediately over pumpkin cakes. In medium bowl combine and mix (with spoon) cookie dough with flour. Dough should be stiff. Shape dough into balls and roll in orange (colored) sugar crystals. 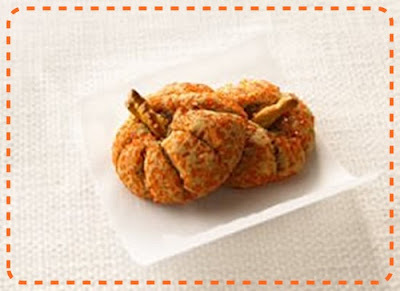 Insert 1 pretzel piece into each sugared ball to form pumpkin stem. Using toothpick or tip of paring knife,draw lines for pumpkin ridges. Bake 325 for 10-12 mins. or until firm and golden brown. I am very thankful for your friendships and kind words. You have added a Sweet Surprise to my life. May you have a delightful Thanksgiving surrounded by loved ones and delicious food. Ohh...I'm so excited for you, my friend! I hope you get the camera of your dreams!!! Now...about all of these fabulous goodies! I just love, love, LOVE those pumpkin cakes and the little peanut butter pumpkin cookies! They're adorable! I think I'm going to try the peanut butter pumpkins...would make a nice treat for my kiddos for Thanksgiving! Thank you so much for the great ideas and the recipes too!!! Sending you and your family my very best wishes and blessings for a Happy Thanksgiving!!! 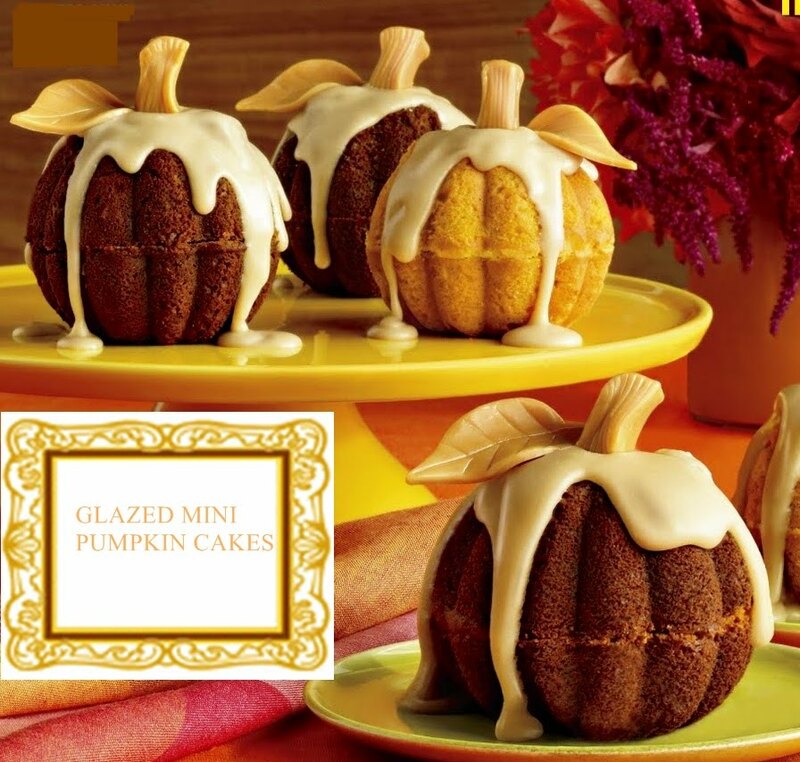 Those mini p0umpkin cakes are adorable! If only we had a Trader Joes. The pumpkin cakes are so cute! How exciting! I just got a new camera about a month ago and love it! It is simply amazing the pictures I am getting from it, compared to my old camera. I love the pumpkin cakes too! Makes me wish I had the pans to make some. Take care and hope you have a wonderful Thanksgiving! I have been seeing the form for those cute little pumpkin cakes and have been temped to buy one and see how they work. I seldom have to do much baking anymore but now and then I love to try something. I enjoyed this post very much..
Have a wonderful Thanksgiving and enjoy every single minute. Congrats on your new camera! Those glazed pumpkins look too good to eat. Happy Thanksgiving to you, too! Awesome post! wow, a new camera would be wonderful, hope your wish comes true! Love the pumpkin recipes, so yummy sounding! Thanks for stopping by my blog. I do hope to have an Etsy store soon, but for now I just show pictures of my work, although I did sell the top hat with the snowmen (275) and I want to sell more, just need to make some!!! You can always email me with queries. Your little cakes look adorable and i bet taste so good. My appetite is back, but I have to be good... the diet starts for real in Jan. I would like a new camera, as well. Mine is fine, but I want some bells and whistles. Hope you have a happy Thanksgiving with your family! I'd love to try those pumpkin cakes. I wish you a Happy Thanksgiving. Sara, returning your visit to wish you a Very Happy Thanksgiving! I'm thankful, too, for all of the many blessings in this life. One of which is meeting so many nice bloggers this year. You are certainly in that number. I'm so excited for you about your camera b/c my husband just surprised me with a new camera also. I was in dreamland [Canon T1i]. I just came upon your Blog and I love it. Thos emini pumpkins are just adorable. What a fun post to read. There was even some sparkle. I hope you have a wonderful Thanksgiving full of blessings and good food! Thanks for coming by to visit too! A new camera...and you get to open it before Christmas? I have one of those bundt pans but never thought to join both sides together. Duh. Hello my Dear Southern Lady. So sorry about your camera,but just think...you get to get another oneeeeee.Yeaaaa!!! I know your Thanksgiving although small will be a great sucess.I know us southern cooks go way out no matter what.So lets start cooking.I just finished a big pot of mustards.They sure were pretty.Yummy.I wish for you and your family a most blessed Thanksgiving...And kitty too. Hello, Dear One! Happy Thanksgiving to you and your family and I too hope you get the camera you want! 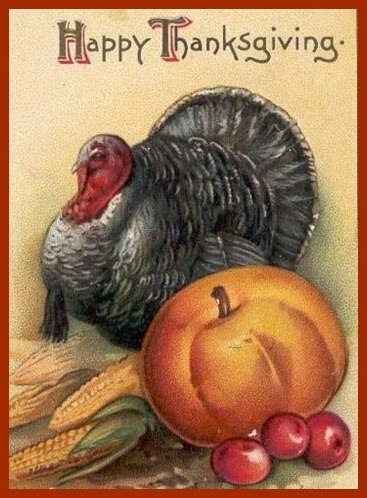 Just wanted to stop back by, my friend...to wish you and your family a wonderful Thanksgiving! Ours will be small as well...just my honey and I and the two kids! But...I'm fixing the traditional turkey and all the fixin's! I got your sweet email and just haven't had the time to write back...thought I would say something here! Ohh my goodness...can't believe that you have family in Greeley. That's where my two step-children live. We make a trip up there every other weekend! Wow...we do live in a small world! I'm very familiar with Greeley...I grew up there! Hehe! Girl, if you ever get out this way for a visit...please let me know so we can get together! I would just love that!!! PS...I'll be watching for your package around the 2nd of Dec....oooh...I can hardly wait!!! I'm so happy to hear your camera has clicked for it's last time (can't believe I"m typing this, but if you're happy... I'm happy!). Those peanut butter pumpkins with pretzels certainly have my attention, they sound so deliciously good. I may have to try to bake some to enjoy with my diet Coke - one offsets the other, correct? Have the happiest of Thanksgivings! Thanks for coming by to visit and leaving such a nice comment. Those pumpkin cakes are just tooo cut! Thanks for all the inspiration. Blessings to you and yours as you enjoy Thanksgiving. 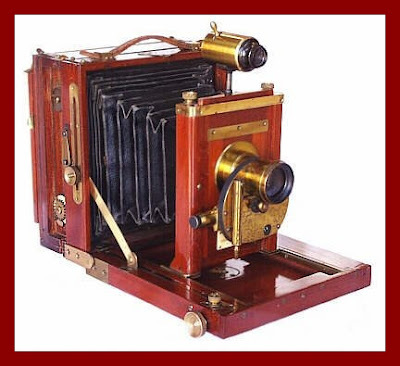 I sure wish MY ancient camera would bite the dust! I can't justify buying a new one while it still works just fine, but I'd love a newer one. Hi Sara thanks for stopping in today. Good luck on your new camera. I love mine. I am a real amature but I love it. Be sure at get one with a rechargeable battery. Thanks for sharing these photo's I looked for vintage and couldn't find much. You did better than me. And they cakes and cookies adorable I have to try that next year. I guess you need a tiny bundt pan. So cute! Thanks for sharing and Have a Blessed Day. I love those little pumpkins! Sounds easy and fun to make! Have a wonderful holiday! Camera shopping sounds like so much fun!! What a beautiful post!!! Maybe Santa will bring you a new camera **wink** but you'll need to be very specific about the details so he'll get it RIGHT!! Thank you so much for stopping by. We'll be small in number as well, going over to my Dad's. Wishing you a wonderful Thanksgiving! Oooh, new camera. I am so, so envious, I hope you get what you want and give me the report on it. I am so hoping for a new camera...soon. Enjoy your holiday with the family, maybe your cat is vegetarian? OMG ~ lucky you Sara. My camera should go in the trash and I was hoping to get one for Christmas but we just lost some of our income and it won't be more than a homemade Christmas this year unless I win one. LOL. 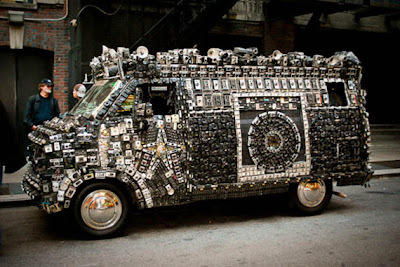 I hope you get the camera of your dreams!!!! Those pillsbury pumpkins are so cute. And they look so elegant and surprisingly simple. I difinitly plan on making these. Dear Sara. Thank you so much for coming by an leaving me such sweet comments and wishing me happy Thanksgiving. I'm wishing you the same. I hope you and your family truely enjoy it. It sounds like it's going to be so yummy! I'll be picturing your small family celebrating while my small family (Neil, his 89 yr old Mother, who lives with us & myself) are sitting down to dinner. Sweet recipes and I'm hoping my camera closes it's eyes too! So need a good one! blessings to you and your family this Thanksgiving! Thanks so much for your Thanksgiving Day wishes...I am excited about your new camera too! I think I need one of those for Christmas! Have a fun, food-filled, blessed day tomorrow. 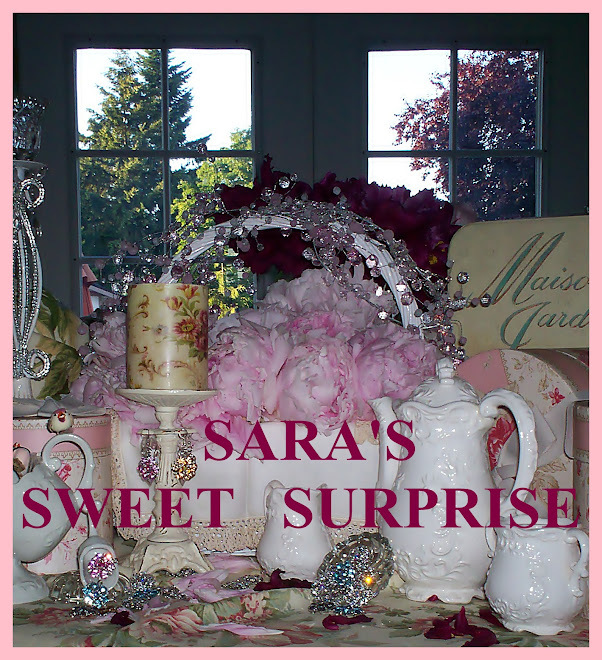 Sara, you are so very sweet to stop by my blogg and leave you sweet message. Your receipts are to die for. I'll come visit again. Happy Thanksgiving. Thank you for leaving such a dear, dear, comment on my last post. It warmed my heart. Congrats on the new camera! This post was fun to read and I love the little pumpkin cakes. Have a wonderful Thanksgiving. Thanks soo much for dropping in to say hello, and wishing me a Happy Thanksgiving day !! This made me laugh so hard .. LoVe that van !! Those darn cameras .. we just can't live without them tho .. I soo hope your holiday is nothing but blessed, and I soo hope you feel up on lots of yummy food .. We can worry about that later .. hahaha .. thanks for the giggles, and love and hugs for you. I am so jealous that you get to shop at Trader Joe's! I've never lived near one and never visited one during my travels. Those pumpkin bundt cakes are too precious. A new camera, you're one lucky lady, woo, woo! I'm trying to stay off the sweet stuff, but your such and evil temptress. Wishing you a Happy Thanksgiving. Yum...now I'm hungry and it's past bedtime. I'm sorry about your camera but hope you find the perfect one...and on sale too. Thanks for your sweet comment today. Happy Thanksgiving to you and yours. Hope all has been well!! I will definitely be more active after the holidays. Darling pumpkin cakes - I've gotta try that! Have a great Thanksgiving Sara! I'm so glad I've met you in this big world!! thank you for your warmly coment to me. Your blog absolutely fantastic and I like all of pictures and post.Pumpkin recipe sounds gorgeous! Gorgeous post!! Thank you for sharing all of that yumminess with us! 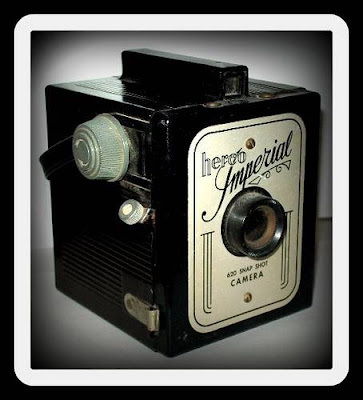 Oh I so want a new camara and the death of one is the way to go for sure. good luck and making some cool choices, there are so many to pick from out there. I wish the best for you and yours this Holiday season!!! Thanks for "strolling" by my blog, Sara! I hope you and yours have a very Happy Thanksgiving, as well! Sara, love the goodies, yum! Thanks for sharing! Thanks for stopping by my blog..stop by often! I love those petite PB pumpkins. I do really well with miniature desserts b/c otherwise I just gorge on them, as evidenced by last night. I hope you had a lovely Thanksgiving! What kind of camera are you looking to get? I am going to have to try the Trader Joe's pumpkin mix - thanks for sharing. Sara, I hope Santa is listening to you. Please come Follow me on my new blog ... had issues with the old one. We are having a huge GIVEAWAY ending Dec. lst. Thanks for visiting my blog...I am a tad behind on getting back to you.. My camera is the Canon Rebel T1i - it is the newest Rebel - came out the end of May - I do love it so ! I hope you get a new camera soon ! A new camera! Congratulations! Can't wait to see what you get. Thank you for leaving such a sweet comment on my blog.